Behdad Esfahbod's daily notes on GNOME, Pango, Fedora, Persian Computing, Bob Dylan, and Dan Bern! It was interesting to see Uraeus experiencing the same problems with burning DVDs that I did originally when I got my (now dead) laptop. The surprising point indeed is that cdrecord (as shipped with Fedora) cannot burn DVD+R's (not sure about other types) but growisofs does that flawlessly. For mkdvdfs to work, all files should have all-capital filenames. That became a small issue last week when I was trying to burn a home-made DVD from files on a FAT32 partition on an external harddisk of a friend, as by default, vfat mounts tolower all the all-caps names. The shortname=win95 mount options does the trick, but it doesn't work with -o remount, so you have to umount and mount again. 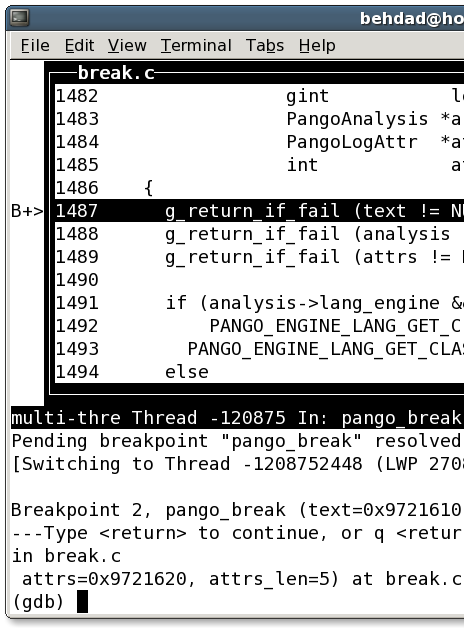 Pango-1.10.4 is probably the last Pango release in the 1.10 branch. Vte, Gucharmap, and Dasher are just waiting for more translations before turning into final releases for GNOME 2.14, and Pango-1.11.99 is named so "Just In Case." So I'm done with GNOME work for this cycle. Can cross my fingers until the next tarballs-due before rolling some more. I made a supposedly better, cool, Tango-based icon for Dasher. Looks like this: . It's got a semi-transparent background. My first version had a transparent background, like this: . The old dasher icon was this: . Comments welcome. That said, gucharmap can use a better icon. Filed here. Turing Test or Dumb Humans!? This happened today in #gtk+. Only after receiving a /msg from Dorito with the bug information and doing /whois Dorito I figured it's actually a bot; I was joking when I said "Dorito: you're a bot!" (16:08:56) Dorito: behdad: lazy humans! (16:09:31) behdad: Dorito: that's why computers are for. (16:10:34) Dorito: behdad: no computers are to make fun of you! (16:13:16) behdad: Dorito: you're a bot! GLib 2.10.0, which is the final GLib release for GNOME 2.14. Thanks to Matthias Clasen for producing yet another great release of our beloved Swiss Army knife library. Fontconfig 2.3.94, which is far more stable than the previous beta of the (hopefully soon) upcoming fontconfig 2.4.0. Kudos to Patrick Lam, without whom there could not be a fontconfig 2.4. Last but not least, FreeType released the third release candidate for the upcoming FreeType 2.2 release, and the previous two release candidates where released during the past four days! Well doneDavid Turner and Werner LEMBERG. Now David Turner is my hero of the day. If you don't know, FreeType started not exposing its internal headers anymore, for sometime, all in CVS. This was known to break several major libraries and applications, including but not limited to Pango, Qt, and fontconfig. First thing David did was sending patches to each of these rogue clients to make them not use the private headers. But as time passed, it became clear that releasing 2.2 without the private headers and symbols, would break several (mostly Debian) systems seriously, and there was no easy solution to that. See here for details of the problem. In the past couple of weeks, David finally decided that the only way to not break lots of systems is to provide wrappers for old internal API to make applications using private parts of previous FreeType versions still working with FreeType 2.2. That's as someone put it on the mailing list, in the level of backward compatibility that only companies like Microsoft and Sun bother to provide. Well done David. Tiny and trivial yet useful tip: By default, ext2 and ext3 filesystems reserve %5 of the capacity of the partition for root, such that if the users fill up the partition, services running as root (as well as commands the root user runs) don't fail right away. You can reclaim that precious %5 on your /home or other user-only partitions by doing tune2fs -m 0 /dev/hdaX. I have to look around and clean up space on my harddisk every other week, so gained some 2.5GB this way and I'm so happy about it (-:. Pouria is one of the coolest Iranian/Canadian friends that I've made in Toronto when I came here in 2003. Since last Summer, he's in Afghanistan as a Red Cross translator/volunteer. He writes an interesting weblog and recently has started a photo stream on flickr too. Anyway, on Monday I was reading through his recent weblog entries when I hit his Weekend in Samarqand post where he explains among other things how the kebabs in Central Asia are much better than in Afghanistan. Later he made another post with photos of said kebabs. Damn, they look delicious! Watched Broken Flowers (Jim Jarmusch, 2005) and Natural Born Killers (Oliver Stone, 1994) on Saturday night with a bunch of friends. Can't say I particularly liked Broken Flowers, not really Jim Jarmusch. But loved NBK. Inspiring even, and what a sound track! Yesterday, it was the grad visit day in the CS department where candidates for next year grad students where visiting. I was part of the theory group team of it, chatting with them over snacks, and we (the theory group) went out for dinner in a Chinese restaurant in China town when the Database and Graphics groups were partying in Karan Singh's place. The food was a real treat though. We tried more than ten dishes, every single one of them could make a delicious dinner in itself. Playing with gdb, I just discovered gdbtui. Very nice tool. Give it a try if you've not before. Please do me and several other (CVS) users a favor and do NOT turn -Werror on under ANY condition. I will (and several other will too) appreciate if you respect our decision-making ability and freedom of choice on which compiler flags to use. Let me assure you that I better understand about my compiler and compiler options, than your five lines of configure.in magic can ever do. Let vte-0.11.18 and pango-1.11.5 out for next week's release. gucharmap is blocking on Behnam reworking his patch, and Phil will release dasher tomorrow as he has release access now. Wow, that's four releases in one month!? I like making devel releases crazy like this, as Matthias pushes them in rawhide and they get a lot of testing. No major regressions so far, even though I've been committing crazy stuff (will post about in a second.) Anyway, I think I'm alsmost done with Pango for this GNOME cycle. The rest of changes that I have patches for need some more work and I don't think I can get them done in time for some testing. VTE patches are in CVS. The throttling one, the faster private, and the efficient sequence handler table that I just cooked. The throttling reduces the time for a warm "ls -R /usr/lib" from above 5s to below 2s with no sensible difference on the screen. I've been doing some little performance work on vte, everyone's favorite terminal emulation library. See the report and patches in the performance-list archives here. Please follow up on the mailing list for technical discussion. Now I've been in love with the bash_completion package for a couple years now. I've always wondered about how much performance hit does it cause, by loading all the completion rules for all commands known to it in every bash shell, which is default shell in any decent Linux system, every single time... But never measured before. so it doesn't run in non-interactive shells. That's it! Fer writes up about the new cool stuff going into Bug Buddy, the GNOME automated bug reporting tool. I'm sure somebody on the SysAdmin team would be happy to implement that :). Update: I was just informed that in fact http://bugs.gnome.org/123456 indeed works ("bugs", not "bug", btw.) Ok, to have something proposed anyway, would be cool to have http://bugs.gnome.org/pango redirect to where it should too. As a followup to the David Gilmour tour that we couldn't get tickets for, it seems like he's in fact touring a new album, On An Island, due to release on March 6, just before the tour begins. Nice move from Dave indeed. More interesting detail of the album revealed in the linked page above is that the album features orchestrations by renowned Polish composer Zbigniew Preisner. Now Gilmour I have always liked, as much as I like Pink Floyd, and Preisner has been my number one favorite composer. Never I expected though that they will work together... Not in my dreams!